This beach is a popular morning surf spot, and the winds make it a good place for hang gliding and flying kites. This area is more frequently cloudy than others and resultantly there is hardly anyone around other than the morning community of surfers monitoring wave conditions. A wooden hang glider launch looks over a precipice that slopes down to a long, sand dune studded beach. Behind the beach is a dune preserve, where visitors can walk a trail with information about the native plants and animals. Dogs are not allowed. This long beach runs from the Monterey Beach Hotel past Casa Verde road all the way to Downtown Monterey’s wharf #2 /fishing pier. This long, slowly curving beach is popular for dog walking and jogging. The Western side near the commercial pier/ wharf #2 is a popular place to picnic with children as the water is calm and shallow a long way out. It’s a good place to try swimming in the cold ocean water without the worry of strong currents or waves. Adjacent to this beach are beach volleyball courts and kayak rentals. The North end of Del Monte Beach is usually accessed by Casa Verde Road and is popular with beginner surfers and body surfers. From this angle the sun sets over the peninsula. This area features a pleasing view of the Monterey Peninsula, and its lights at night. Bonfires are allowed and dogs are welcome. So near to the touristic distractions of Cannery Row it’s a surprise to find such a pleasant little plot of beach. Off to one side is the Coast guard pier which hosts a colony of sea lions at the end. San Carlos Beach is a popular scuba diving destination as it is well sheltered and there is a long sunken barge thee hundred feet from the pier. Dogs are not allowed. 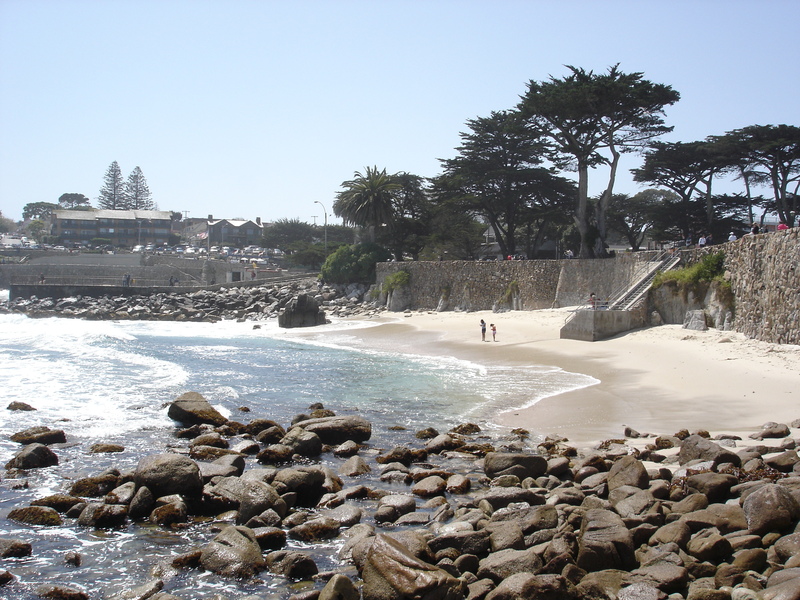 Off the quaint downtown of Pacific Grove and along the scenic coastal drive is this idyllic park with two little sandy beaches and a rocky outcropping that even adults can’t resist climbing over. This is a particularly good beach for snorkeling as the underwater habitat is host to many types of fish, grasses, and marine mammals. When the swell and tide are right, some lefts break off the point for surfers who don’t fear the submerged rocks. There is a beach volleyball court, kayak rentals and a snack bar. Dogs are not allowed. Midway between Lovers Point and Asilomar state beach, on the scenic drive along Ocean View Blvd and Sunset Drive, are some terrific tide pools. Near thelighthouse, when the houses end and you pass a section of the golf course, a large rock outcropping is distinguishable by its flat, green ice-plant covered top. It appears from the road like a groomed putting green. The ancient drain pipe acts as a bridge over marvelous tide pools. Check the marine forecast in the newspaper and go at very low tide, ideally those in the negative. This mass of rocky habitat becomes an island at higher tides, so plan your visit accordingly. Steady rolling waves roll up onto whitish sand, where a rocky trail and tidepools give way to this popular surfing beach. A coastal trail and boardwalk make this a nice place for an easy stroll with plenty of beauty to enjoy. Dogs must be on leash near the road/ state beach side. Beyond the small stream of water the beach is Pebble Beach land and the leash rule doesn’t apply.